Injury of the fingertip is the most common injury of the hand and fingertip amputation is the most common amputation in the upper extremity. The pulp of the fingertip is that part of the finger with the richest vasculature and the highest density of nerve ends. A normal digital pulp is vital to the interaction between the brain and the upper extremity required in the finest daily activities. The contribution of the digital pulp to key pinch and tip pinch depends mainly on its neurovascular integrity. Pulp support by the nail is also needed for tip pinch and key pinch. This report analyses 81 consecutive cases (77 patients - 81 digits) of homodigital neurovascular island flaps operated on by one surgeon between 2002 and 2014. The surgical technique, indications, contra-indications and three year results are evaluated. Overall, these flaps provide reliable vascularity as well as normal sensibility at the distal end of the finger where high quality perception is required. Small tissue losses involving the distal segment of a finger are quite frequent. Management of these injuries is controversial. Opinions vary from the simplest conservative treatment [1,2] to the most sophisticated microsurgical reconstruction techniques, using various types of flaps [3-9]. Mouchet & Gilbert  described the use of the monopedicled volar neurovascular island flap in children and Foucher et al. reported their preliminary experience in adults. 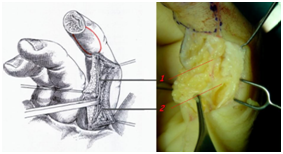 Overall, surgery in the hand should aim at preservation of adequate and functional length of the digits, immediate coverage of the wound, preservation of sensibility at the distal pulp, adequate distal interphalangeal joint motion, a painless scar, short hospital stay and morbidity and early return to work and other daily activities [11,12]. In this study, I present the results of a large series of patients who were treated with homodigital neurovascular island flaps based on a single neurovascular pedicle to reconstruct amputated fingertips. Between 2002 and 2014, 83 fingertip amputations in 79 patients, with a mean age of 36.8 years (range 2- 65 years), were reconstructed, using a homodigital neurovascular island flap technique. The majority of these cases were operated within the first 24 hours after the injury, while 7 were operated on electively. Two patients were lost to follow-up and were not included in the study. Thus, the study includes 81 fingertip injuries in 77 patients (66 men and 11 women). The mean patient age was 36.8 years with a range from 2 to 65 years. Thirty two injuries occurred in the right hand and 45 in the left hand. The thumb was injured in 3 cases, the index in 32, the middle finger in 24, the ring finger in 13, and the small finger in nine cases. These injuries included agricultural, industrial and domestic injuries. To describe the level of fingertip amputation, Allen’s four-type classification was used as it offers a comprehensive description of the injury . According to Allen’s classification, the injuries in this series were classified as type II in 19 cases, type III in 46, and type IV in 16 cases. The procedure was performed under axillary block, with tourniquet control and use of magnifying loupes. Contraindications to use of the procedure included injuries to the neurovascular bundle (recent or old), a severely contaminated wound and underlying angiopathy. In cases of finger fracture, it was stabilized first, before raising the flap. The homodigital flap is supplied by the digital artery and the corresponding digital nerve. Release of this neurovascular pedicle allows the advancement of the flap . The flap is designed and the procedure carried out on the radial or ulnar side according to the finger affected. It should be noted that we should avoid using a flap from the ulnar side of the thumb and little finger and the radial side of the index. The outline of the flap is made over the lateropalmar aspect of the distal phalanx, just proximal to the defect (Figure 1). The pedicle is progressively released, taking care to spare the nerve branch at the level of the middle of the proximal phalanx (Figure 2). 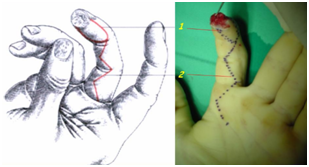 Slight medialization of the neurovascular pedicle together with slight flexion of the finger permits advancement of the flap (Figure 3). The donor site is covered with a full thickness skin graft, usually harvested from the palmar surface of the distal forearm (Figure 4). The neurovascular bundle is protected under the skin flaps created during dissection of the flap to avoid placing the skin graft directly on the bundle. At this point of the procedure, the tourniquet is deflated and perfusion of the flap is inspected. Careful haemostasis is completed. The size of the flaps in this series ranged from 1x1 to 2.3x1.5 cm2 and the maximum advancement was 19 mm. There was never a need for further shortening of the bone. The duration of the procedure from skin incision to tourniquet release to inspect the viability of the flap ranged from 35 to 45 minutes. Postoperatively, the hands were dressed and immobilized in a dorsal splint (for a period of 2 weeks) and the patients released from hospital on the same day. Gentle active exercises were started at the time of removal of the dressing and sutures at 15 days postoperatively. Special care was given to preventing loss of extension of the interphalangeal joints of the finger. The patients were evaluated with objective and subjective criteria. The objective criteria included sensibility testing for two-point discrimination and measurement of the ranges of motion of the proximal and distal interphalangeal joints. The subjective criteria included an assessment of deformity and a rating of pain complaints relating to sensitive scars, neuromas and cold intolerance, as well as the patient return to his previous occupation. Figure 1: Design flap and Incision. Figure 2: Digital artery & nerve and Dorsal branch of the digital nerve. Figure 3: Coverage of the donor area with a full-thickness skin graft. Figure 4: Donor site is covered with a full thickness skin graft, usually harvested from the palmar surface of the distal forearm. Follow-up ranged from 12 to 60 months, with a mean of 36 months. All of the flaps survived. Static two-point discrimination in the flaps ranged from 3 to 10 mm, with an average of 5 mm. Seventy-six flaps had a static two-point discrimination between 3 and 6mm and the remaining five had a static two-point discrimination between 7 and 10 mm. The final value of the static two-point discrimination was achieved at 10 to 12 weeks. In 79 of the 81 fingers, the range of motion was normal for the proximal and distal interphalangeal joints. Two fingers had a loss of extension of up to 10°. No patient complained about pain in the reconstructed area at rest or when using the finger. There were no complaints of sensitive scars or reported symptoms of neuroma formation. Hypersensitivity to cold (cold intolerance) was reported by four patients and lasted about 6 months. The number of patients with cold intolerance is small compared with other series, possibly because of the warm climate in the area, as all patients live in the area of Athens, which enjoys high temperatures for most of the time. The appearance of the reconstructed fingertip was evaluated by the patients as good (46 fingers) or excellent (35 fingers). Return to work was achieved in a mean of 45 days (from 35 days to 90 days). Manual workers continued their work without difficulties. Allen MJ (1980) Conservative management of fingertip injuries in adults. The Hand 12(3): 257-265. Buckley SC, Scott S, Das K (2000) Late review of the use of silver sulphadiazine dressings for the treatment of fingertip injuries. Injury. Injury 31(5): 301- 304. Atasoy E, Ioakimidis E, Kasdan ML, Kutz JE, Kleinert HE (1970) Reconstruction of the Amputated Finger Tip with a Triangular Volar Flap. J Bone Joint Surg Am 52(5): 921-926. Tranquilli-Leali E (1935) Ricostruzione dell’apice delle falangi ungueali mediante autoplastica volare peduncolata per scorrimento. Infortunistica e Traumatologia del Lavaro 1: 186-193. Kutler W (1947) A new method for fingertip amputation. JAMA 133: 29-30. Gurdin M, Pangman WJ (1950) The repair of surface defects of fingers by trans-digital flaps. Plast Reconstr Surg 5(4): 368-371. Brian Rinker (2006) Fingertip Reconstruction with the Laterally Based Thenar Flap: Indications and Long-Term Functional Results. Hand 1(1): 2-8. Takeishi M, Shinoda A, Sugiyama A, Ui K (2006) Innervated reverse dorsal digital island flap for fingertip reconstruction. J Hand Surg Am 31(7): 1094-1099. Littler W (1953) The neurovascular pedicle method of digital transposition for reconstruction of the hand. Plast Recon Surg 12(6): 303-331. Mouchet A, Gilbert A (1982) Covering distal amputations of the finger using homodigital neurovascular island flaps. Ann Chir Main 1(2): 180-182. Foucher G, Smith D, Pempinello C, Braun FM, Citron N (1989) Homodigital Neurovascular Island flaps for digital pulp loss. J Hand Surg 14(2): 204-208. Stevenson TR (1992) Fingertip and nailbed injuries. Orthop Clin North Am 23(1): 149-159. Edward A, Jackson MD (2001) The V-Y Plasty in the Treatment of Fingertip Amputations. Am Fam Physician 64(3): 455-459.